"Looking for a fun and budget-friendly wedding centerpiece idea?".. 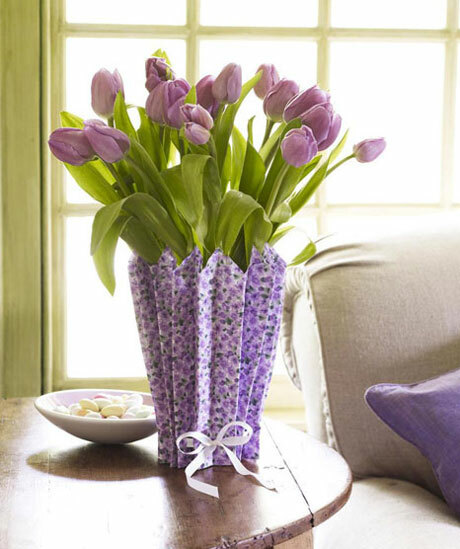 Make a simple, seasonal floral bouquet really pop, by placing a plain glass vase into a pleated vase sleeve made of a coordinating floral cotton fabric. How? Also buy some fusible backing (something glue-able, ideally precoated, from the craft store), for stiffness and to keep the cut fabric from fraying. Iron the fabric onto the backing and press in folds. Snip the ends, if you like to create those points at the top. Cut small slits on each pleat to allow for a ribbon to wrap around your creation. Make a bow with your ribbon to complete the look. Choose a fabric and pattern that will compliment both the size and colour of the flower and your creation is sure to be a winner! Add some fresh flowers and cheap vases from the dollar-store and .. ta-daaa.. instant happy spring centrepieces! We love tulips because they come in a variety of colours and are readily available this time of year but, obviously, you can use any flower that you like!